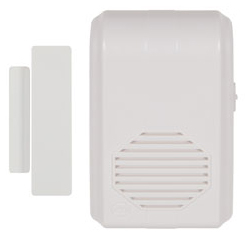 Entrance Alert is an easy to install device, which notifies you when your door is opened. It greets visitors, customers or clients with the sound of music and alerts you to their presence. Entrance Alert is an easy to install device, which notifies you when your door is opened. It greets visitors, customers or clients with the sound of music and alerts you to their presence. Just mount the small transmitter and magnet to any door and plug the remote receiver unit into any electrical outlet. No wiring is required. When a monitored door is opened, the Entrance Alert sends a signal to the remote receiver, announcing an entrance with music. Moving to a different room? Remove the receiver and plug into the electrical outlet at your new location or purchase an additional receiver for every room. There are ten sounds that can be selected with the push of a button on each transmitter. Entry Alert can also be used as an alarm. Alarm sound can be selected with the switch located on the transmitter.